At the invitation of the Governments of the United Arab Emirates, the Arab Republic of Egypt, the Republic of Equatorial Guinea and the Republic of Cameroon, Yang Jiechi, Special Representative of President Xi Jinping, member of the Political Bureau of the CPC Central Committee and Director of the Office of the Foreign Affairs Commission of the CPC Central Committee, will pay official visits to the UAE, Egypt, Equatorial Guinea and Cameroon from January 13th to 19th and attend related activities of the World Future Energy Summit in the UAE. Q: You said here yesterday that you hope the media could accurately read and understand the article by Chinese Ambassador to Canada, Mr. Lu Shaye. But we see that Ambassador Lu's article indeed made a comparison between the case of Ms. Meng Wanzhou's detention and the cases of the two Canadians detained by the Chinese. There are divided views in Canada on Ambassador Lu's article. What is your further response to this? A: Yesterday, it was after some media claimed that Ambassador Lu Shaye's article refers to China's compulsory measures on the two Canadian citizens as retaliation for Canada's detention of Meng Wanzhou that I suggested the relevant media to carefully, thoroughly and accurately read the article of Ambassador Lu. As you can see, Ambassador Lu did not say such a thing in the article. 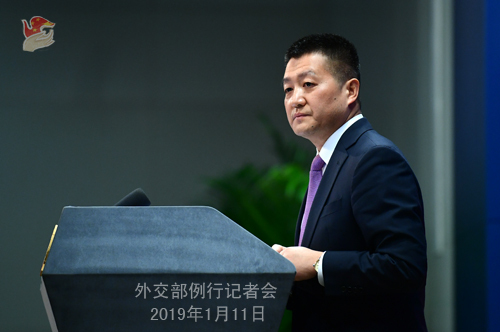 It is true that Ambassador Lu did make a comparison between the Meng Wanzhou case and the cases of the two Canadian citizens who were taken compulsory measures. However, if you read this article carefully, it is not difficult to see that through comparison, Ambassador Lu vividly exposed the hypocrisy that some Canadians have shown in manipulating the concept of "rule of law". The Canadian side, solely at the behest of another country, unjustifiably detained a Chinese citizen who, even as the Canadian side itself has acknowledged, has violated no Canadian laws. However, it hurled accusations against China when we have publicly told the world that these two Canadians were taken compulsory measures in accordance with law for involvement in activities that endanger China's national security. Is it true that in the eyes of Canada, the laws of other countries do not deserve to be respected as laws? Flagrantly applying double standards to the rule of law is in itself a disrespect to the rule of law. Ambassador Lu's article may have poked the sore spots of some Canadians. If they are pained by this, we hope that they can think about why and immediately correct their mistakes, otherwise things could be even worse. Q: Can you confirm that Vice Premier Liu He will be going to the US at the end of this month? A: The Spokesperson for the Commerce Ministry has responded to this question at yesterday's press conference. Now China and the US are in close communication on the arrangement of the next-step China-US trade talks. Q: Yonhap News cited the head of the ruling ROK party Democratic Party of Korea that President Xi Jinping will visit the DPRK in April, and the report also said that chances of President Xi Jinping going to the ROK in May are pretty high. Can you confirm that? A: Yesterday I said that China and the DPRK have the fine tradition of maintaining high-level exchanges. We will release relevant information in a timely manner when we have it. As for China and the ROK, we also maintain friendly relations. High-level exchanges between China and the ROK serve as an important force in promoting the growth of bilateral ties. We will also issue relevant information in a timely manner when we have it. Q: Czech Republic President Miloš Zeman said that China is preparing to take responsive measures in reaction to the claims of the Czech National Cyber and Information Security Agency that Chinese company Huawei represents a threat to its national security. He said that these measures might affect the interests of carmaker Skoda Auto and PPF Investment Group. Could you confirm this? And if yes, could you give any details about these measures? A: I need to check on these statements that you said were made by the Czech President. According to the reports I saw, President Zeman said that the warning on Huawei issued by the Czech National Cyber and Information Security Agency has no basis. That is the statement by President Zeman that we have noted, and we appreciate the positive attitude demonstrated by the Czech Republic towards promoting the growth of China-Czech relations. At present, the relationship between China and the Czech Republic is developing well overall as evidenced by fruitful outcomes in across-the-board cooperation, which has delivered tangible benefits to the two sides. We stand ready to work with the Czech Republic to further deepen bilateral cooperation based on mutual respect, equality and mutual benefit which would be beneficial to both sides. Q: I want to ask about the case of Robert Schellenberg. China will have a retrial on his case on Monday. We have been informed that there were several legal irregularities on how his case was handled. So, is the Foreign Ministry aware of these legal issues and does this violate Chinese legal regulations? A: Whatever falls within the remit of the court should be handled by the court. As an executive department, the Foreign Ministry should not interfere in that. This is called the rule of law. As for the specifics arising amid the trial process of this case, the defendant himself should be very clear about that. If he thinks that there is something wrong, he can surely lodge a complaint in accordance with the due legal process. Many criminal suspects did that amid trial. He can also do that. Q: From the initial detention to the first verdict, the Schellenberg case has lasted four years. And prosecutors last month requested retrial, saying that they had new leads. Now after ten business days, there will be a retrial. Some say that such a rapid speed suggests political factors and diplomatic considerations. What's your comment? A: Just now you said some people suspected that there is political manipulation. You can ask these people which legal articles the relevant Chinese judicial organs and departments have violated by taking these measures. If no articles are violated, I hope that these people can stop so recklessly suspecting others of politicizing legal issues, just because they have done so. Q: US President Trump has canceled his trip to the Annual Meeting of the World Economic Forum in Davos. Some media suspected previously that President Trump and Chinese Vice President Wang Qishan may discuss trade issues during the Annual Meeting. Does it seem that this chance is dimmed by now? Does China have plans to meet with other US representatives at the Annual Meeting? A: You said that it is reported that Vice President Wang Qishan may meet with President Trump during the 2019 Annual Meeting of the World Economic Forum in Davos. I have said here before that I have not heard of such an arrangement. As for whether Vice President Wang Qishan has other meeting arrangements during the Annual Meeting of the Forum, previously I announced here that during his attendance, Vice President Wang will deliver a speech at the Forum, meet with Executive Chairman Schwab, and have exchanges with other attendees of the Forum. Q: In a report issued on January 10, the Bundesverband der Deutschen Industrie (BDI) stressed that German firms need China as a market but sounded the alarm about China's reluctance to open up market. It called on the European Union to adopt a tougher policy toward China and urged companies to reduce their dependence on the Chinese market as concerns mount over such unfair practices as price dumping and technology transfer. What is your comment? A: Frankly speaking, similar arguments are nothing but dishing up the same old stuff. However, each time such questions are asked, we are given opportunities to showcase China's achievements in reform and opening-up. Before answering your question, I want to quote a few of the latest numbers. I once said here that according to the World Bank's Doing Business 2019, which was recently released, China's business environment ranks 46th in the world, 32 places higher compared with that of 2017. In the case of Germany, according to rough estimations by the Chinese side, from January to November 2018, German companies increased their investment in China by 86% compared with that of 2017. For example, BASF in Germany is actively promoting the construction of a new smart Verbund site in Zhanjiang, Guangdong, which will be the first wholly foreign-owned enterprise in China's heavy chemical industry with the total investment expected to reach 10 billion US dollars. If you recall, yesterday I also talked about the Tesla Shanghai Plant that has just began its construction. Capital votes with its feet. If the Chinese market is not open enough and full of barriers and challenges, as alleged in some reports, then how can it attract so many foreign companies, including German companies, to invest in China? What I want to emphasize is that the progress China has made in opening markets over the past 40 years of reform and opening-up has been witnessed by all. China will continue to deepen reform, expand its opening-up and continue to relax access restrictions on foreign investment. Trade cooperation, mutual investment and technology transfer between China and Germany are the results of voluntary transactions by market players, the essence of which is a mutually beneficial relationship. It is hoped that the relevant institution will view the China-Germany economic and trade cooperation in a positive and objective light and not mislead and damage the good atmosphere of bilateral cooperation. Q: At yesterday's New Year press conference, ROK President Moon Jae-in talked about the situation on the Korean Peninsula, ROK-DPRK relations, DPRK-US dialogues and the denuclearization, saying that China has been playing an important and positive role on the Korean Peninsula issue. What is your comment? A: We have noted the relevant remarks by President Moon Jae-in. 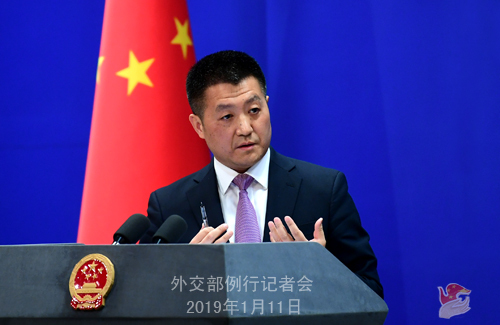 China speaks highly of the positive efforts made by the ROK to move forward the denuclearization of the Korean Peninsula and the political settlement process of the Peninsula issue and promote the reconciliation and cooperation with the DPRK. Since last year, thanks to the concerted efforts of all relevant parties including China and the ROK, the situation on the Peninsula has witnessed important positive changes. In the new year, we hope that all relevant parties can maintain the momentum for dialogue and continuously promote the denuclearization of the Peninsula and the political settlement process of the Peninsula issue. China always supports the DPRK and the ROK in seeking reconciliation and cooperation and improving their relations. We will also support the DPRK and the US in meeting each other half-way and addressing each other's concerns through dialogue and consultation. China will continue to play its part in this regard.